The Librarian at the reference desk. How do you manage your workflow at the reference desk? 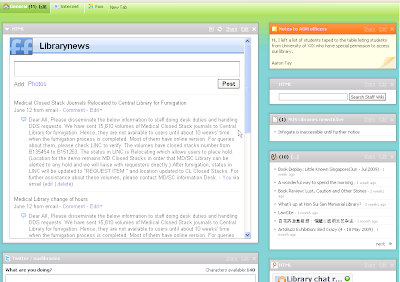 Reference desk duty is probably the most interesting part of my day, as I get to interact with users. 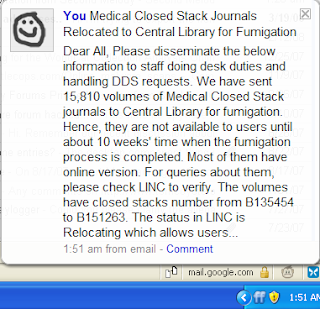 One thing that interests me greatly is how different librarians setup their systems to respond to users. As I see it, there are two main competiting interests. On one hand, you want to be able to work on your own library assignments during idle periods. On the other hand, you want to be able to quickly put aside your work and attend quickly to the user in front of you when he consults you. Of course how your setup your browser, your desktop, would depends on a myriad of factors, from the types of help channels you are monitoring (some librarians handle anything from Skype to Twitter to Meebo while other more traditional librarians handle only phone calls and in-person reference transactions. ), to the type of queries you usually receive (directional vs research), to the nature of your other duties (cataloguing, event planning, Library information technology etc). 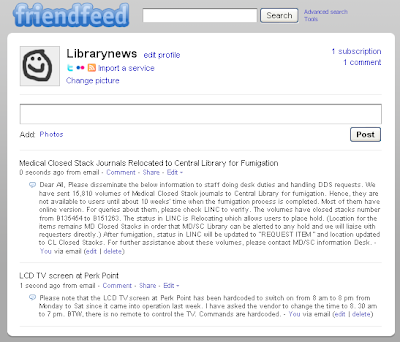 In the past, I suggested that one idea might be to create a mashup of most commonly used resources into a “information dashboard” using tools from Friendfeed to Netvibes (see also RefStart by Text a Librarian -Mosio). These tools would be designed to help you answer queries effectively and efficiently, though there are other solutions of course, such as using opensearch plugins or just opening various browser tabs. The problem here is that these tools help you answer questions efficiently (but see this comment about the dangers of being too efficient without educating users), but they don’t help you manage the interruption, one moment you are working on say cataloging a book, or answering some email to your boss, or editing your subject guide , the next you are assisting a user seeking to find some city-level China data statistic. And if you are like me, while working you will have many windows/programs (FrontPage, Library management system (LMS) interface, Instant Messaging Client etc), browser tabs open and it gets confusing fast (to the user if not you!) when you mix that with the browser tabs and programs you open while assisting the user. By the time, you turn back to your work, you might have forgotten what you were working at (some browser tabs might be closed/replaced already), and this can be the source of serious mistakes. Another problem is that while working you might be viewing and displaying several screens with confidential information (loan records, financial data etc) , and you have to hide/close them before using the PC to assist the user. I’m not sure what the policy is at other institutions, some might forbid the librarian from doing their work at the reference desk, but I suspect given how busy librarians are generally, this is unlikely to be common practice. I’m curious how other librarians tackle this problem. Depending on the policies at your institution, you might not have as many user rights when using the common PC as opposed to your own PC back in the office. Doing a remote access to your own PC, bypasses all these problems allowing you to work with exactly what you are used to. I can continue to work up to the last minute or second while on shift. When someone relieves me, all i need to do is to close the remote desktop (one click), log-out of the common PC, and the work still remains at my desktop PC. This isn’t possible if you are doing your actual work on the common PC, as you have to waste time saving files, closing browsers etc. 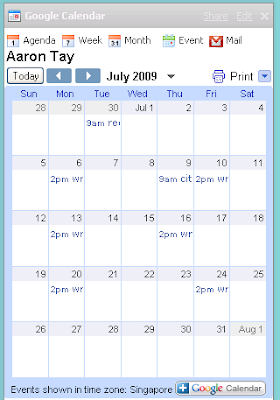 Separation between work done for user and your own work. The idea here is simple, use your remote PC for doing work, switch back to the “real” PC when assisting with queries. The switch can be done in literally seconds. This way when assisting users, you show a relatively clean profile instead of your own work PC which has many confidential windows open. To be frank, I don’t always use the “Real pc” to assist users, often I forget, then I run into problems when either printing say a map for the user (it goes to the wrong printer in my office) or when I insert a thumb drive to copy a file for the user (you cannot transfer the file from the remote PC to the thumbdrive inserted locally). There might be technical solutions to this, but it seems easier to just remember to stick to using the local pc for assisting users. I’m aware that not all institutions are liberal enough to allow users to do remote access, and that there might be other ideas so I’m really curious how other librarians handle it. Use two different physical machines side by side? Some smart “panic” button that closes/hides every window when a user approaches? I’m sure there are many other workflow ideas used at the reference desk, please share how you do it at your reference desk in your comments. I’m also somewhat curious about whether there is a uniform practice within your institution with regards to such matters, or do Librarians generally use whatever method they find most comfortable? I have being heavily using opensearch searchplugins to help speed up access to common used searches at the reference desk. I take it for granted, most people already have Google, Wikipedia, Youtube, Amazon etc. But what else should you add? This one is obvious. I have searchplugin’s to our new Encore system which does a keyword search , and another to do a search by Call number. The latter is necessary because Encore still doesn’t do call number searches yet and a lot number of our patrons like to give me call numbers to verify. Of course, you could always keep a tab open on your OPAC search page, but being able to interrupt your work and instantly look up something without hunting for a tab is good. In earlier posts, I have explained I’m a big fan of Google scholar and Google books. Naturally I have searchplugins for them. Use Google scholar to verify citations, hunt for obscure terms when your other sources don’t find much and a lot more. Google books. 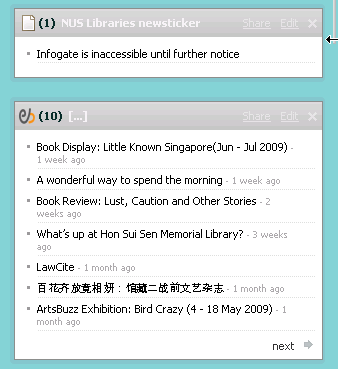 is great for verifying contents of books (those with limited preview or full view). Strangely I find myself doing it more often for books that we own. That sounds a bit odd, but when you can’t leave the desk to verify if a certain book really has the chapter the patron needs (and the catalogue doesn’t have the tables of contents), Google books is a god sent. Also great for remote reference to help patrons decide if they really want to come down physically to borrow the book. We don’t yet have a openurl resolver up yet, so when clicking on Google scholar results sends me to the vendor page, I log-in directly with a bookmarklet that adds our ezproxy string to the url. I’ve considered adding other members of the Google family such as Google Groups (great for tech support), or Google news, but I seldom use them at my reference desk. Want to know the way to the Zoo from the library? To the airport? I’m the last person you should ask, since I was born without a sense of direction. To solve this problem, I have a searchplugin from gothere.sg that allows you to key in any postal code or road name or building in Singapore, and it will automatically work out the best route to go there from the library, whether by driving, or by public transport (Bus and MRT). This can then be easily printed. You can also flip it around with a click so it goes from any location to the Library. Another no-brainer. Often you need to just search for things on your institution’s domain. If a custom google site search for the domain exists, create a searchplugin for it. or if it does not exist and you don’t want to create one you can create a normal Google search plugin, but remember to insert site:www.institutiondomain.edu before creating. If your institution has a specialized intranet search engine (e.g google search appliance), you might want to create a searchplugin for that too. In the same category is a searchplugin for searching your institution’s staff directory. Patrons tend to like to ask questions that require searching of Straits Times, our national newspaper. Since I haven’t yet figured out a way to get the plugin working for Factiva, I created one for Lexis-Nexis Academic which searches our local newspapers. But what about older archived issues not covered? 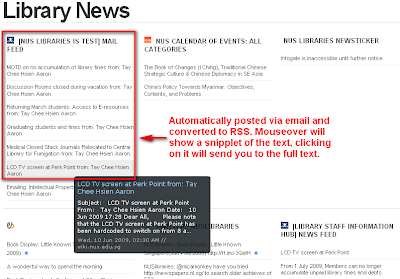 Recently our National Library scanned all back issues of Straits Time (up to 1982) at newspapers.nl.sg I created a search plugin for that, it shows only abstracts, but that is good enough to verify for users whether they want to go to our microflim collection to get the full text. Another common query is for thesis. I generally add PQDT. Some others I occasionally use also are NDLTD, Hong Kong University Thesis etc. They are several you could add. Google scholar already covers quite a bit, but I could envision adding Citeseerx, Arxiv, Biomed central etc depending on your needs. Others you could add include Open J Gate, DOAJ, OAIster to search by article. etc. Try adding the free Open content alliance (via Internet Archive), Universal Digital Library, China-US Million book project. If your institution has subscriptions you could add Springer Books, NetLibrary etc. 9. SearchPlugin for scholarly search engines. Try adding some high quality web search engines, Federated search engines that index academic material only such as Scirus, Mednar, Biznar, Science.gov etc. Be creative, add book vendors like Bookdata online, Worldcat etc. 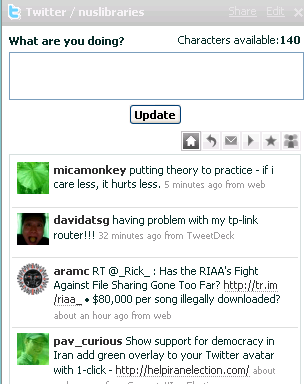 Or Social sites/research 2.0 sites like Librarything, Bookjetty, Citeulike, Slideshare etc. I personally also add Scopus, EconLit, Blackwell-Wiley, Project Muse, for specific reasons to do with the interaction between Google scholar and the proxy bookmarklet that I won’t go into now. Yes, I have a big bunch of searchplugins in my browser. 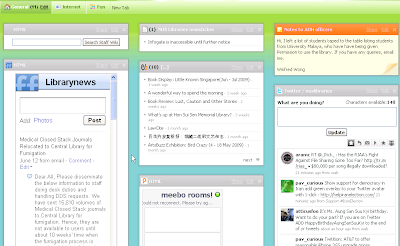 In fact I have 2 lists one for IE7 , one for Firefox. The later I use at the reference desk, the former I use when I’m in the back-room doing cataloguing, acquisitions etc with the appropriate search-plugins. But that is another post. So dear librarians, what search tricks do you use (need not be opensearch plugins, could be smart keywords) do you commonly use at the desk?